Happy New Year everyone! Hope the festive break was good for one and all, and here at Gravity we definitely enjoyed the time off. But now it's back to work with a bang and to kick the new year off in style we've got an update from our design studio on the latest trends as well as a masterclass in carpeting stairs in our 'Stairway to Heaven ...' feature. So until the Spring, happy reading! WE ARE ALWAYS LOOKING OUT FOR NEW TRENDS.. popping up in the hospitality industry and recently we have notices the industry’s penchant for Art Deco and Art Nouveau inspired designs. With Art Nouveau giving rise to Art Deco there is so much inspiration to be drawn from these two styles. From flowing organic shapes in softer pastel shades to architectural geometrics in glamorous chrome and black, and yet both offer a sense of unparalleled luxury and sophistication. So it is hardly surprising that hotels are lavishing themselves in this recent comeback. This season we have been updating and adding to our collection of Art Deco and Art Nouveau designs and they seem to be popular. We have played with colours and introduced softer tones to some of the more Art Deco designs, making them more suitable to a variety of hotel areas. In addition, we have played with scale a bit to make bigger, colder statement rugs that feel a bit more up-to-date.We have also drawn inspiration from our stunning Viscose colour box with its silvery greys and greens and pearly creams and oysters which are just crying out to be woven into a Deco/Nouveau design. 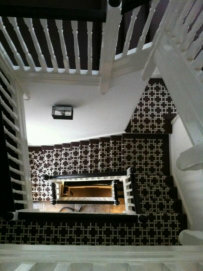 People have been making a feature of stairs and staircases since the dawn of time. 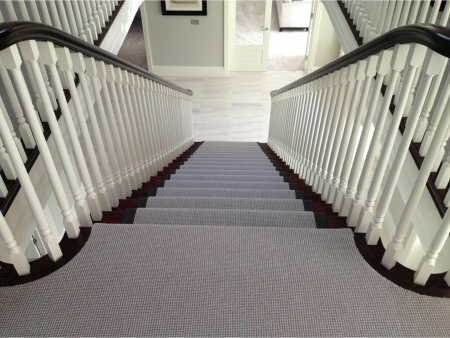 Think of most iconic buildings and houses and the chances are they will either have a classic sweeping feature staircase that is a seamless continuation of the hall carpet as it sweeps majestically upwards through the house or perhaps it's more of a series of straight runs that have been creatively brought to life with a contrasting statement runner. Regardless of the setting or the look that you're trying to achieve it's important to understand the terminology, what is achievable and not and what options you might have available to you in your particular situation. Using the information below may be able to help you to achieve the very best finish that you can. Stairs can be close-fitted (also referred to as close covered) i.e. entirely carpeted from wall to bannister or balustrade where the carpet runs over the 'nose' of the step on each landing and then runs down the stairway and across the whole width of each stair. Stairs that are close-fitted as one piece of carpet can normally be installed at the same time as the main installation. Generally, where you have the tape showing, stitching is secret sewn (so you can't see it at all) and the standard amount of tape showing on the edge is between 5-8cms. Picture B (top) shows a runner that has been bound with a dark leather contrasting tape to the lighter beige loop pile carpet. Additionally, if you go with the 'runner' option, the cut edges will need to be finished so that the carpet doesn't look messy and start to fray.Firstly, the edge can whipped with a yarn that is the same or in a contrasting colour to the carpet. Whipping is like a big 'over-stitch' and is durable and practical. Secondly, the edges can be turned which is where the carpet edge is literally turned underneath itself and fixed to the stair. And thirdly, the edges can be bound with a finishing tape with the binding or tape showing. Tape today is available in cotton, linen, leather and suede (the latter two being either real or fake) and again is normally a contrasting colour to make a feature of the piece. Another option is to have a stair runner which normally needs to be templated. This is where the carpet is cut on site over the stairs and then has the edges finished off-site or a template is made using paper and this is then used to either make or cut the carpet to the specific size off-site. The carpet runner then leaves an equal margin of exposed stair on either side of the carpet, normally 10cm but of course it is up to personal choice at the end of the day. Either way, the carpet can be made up of two pieces of carpet i.e. a body and a border as illustrated here in Picture A. In the past, stair-rods were used to hold the carpet in place with runners, however today they are there purely for decorative and aesthetic purposes. Finishes include polished chrome, antique bronze and brass with the detail of the rod and the fixing being as plain or as ornate as required. Again, these are made to order for each individual stair and should be measured for and installed by an experienced Operative. In respect of install times for body and border and runners, these normally have to be templated and are then taken away and can take approximately two weeks to be finished as required. 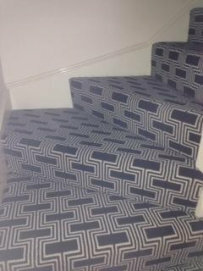 Finally patterns, designs and stripes can work on stairs, as demonstrated so well in Picture B (top) and C.
However as you can see in Picture C it is impossible to get a stripe or pattern to match up precisely going over winders (normally three winding steps over a 90 degree turn) as each step is not at the same angle. What is achievable is pattern alignment rather than pattern matching.